WorldStage has launched its Sx3 AV platform, dubbed the Self-Contained Show System that is designed to significantly reduce set up time, deliver superior reliability and transform the look and feel of presentation rooms with 50 to 500 people. Sx3 is an all-in-one AV solution engineered by WorldStage from the ground up. Pre-configured prior to delivery to each show, the streamlined, compact Sx3 rolls in and sets up quickly, providing an increase in seating capacity due to its space-saving form-factor and cleaning up the clutter of equipment usually found at the rear of presentation rooms. WorldStage developed Sx3 after extensive research confirmed that, while conference general sessions seek to deploy the latest AV technology to impress and inform audiences, AV management of smaller presentation rooms had changed little in the last decade. These rooms typically have large 6 foot tables in the back packed with equipment and cable as well as projectors positioned in the center of the audience, all of which degrade the look of the room and take up valuable space. In this traditional setup, local tech staff spend several hours per room tracking down and assembling components from 12-15 individual cases containing equipment, accessories and cables in the hope of building a system in each room that will actually work. By contrast, Sx3 replaces the six-foot foot table with a 30×30-inch case containing a fully integrated technical rack with pre-installed audio and video components. To further reduce setup time and labor, support gear for each room is contained in three additional customized cases containing speakers, laser projectors, ultra short-throw lenses as well as all accessories and cables. By reducing the typical 15 cases per room to 4, trucking and set/strike labor are dramatically reduced as Sx3 rolls in more quickly and sets up in significantly less time than traditional solutions. Focusing on client feedback that increasing seating capacity in each room was a “Holy Grail,” WorldStage designed Sx3 to include laser projectors with ultra short-throw lenses in every presentation room. These projectors and lenses need only a few feet of depth which allows them to be placed behind the screens, freeing up additional space for more seats in each room where the projector used to sit. 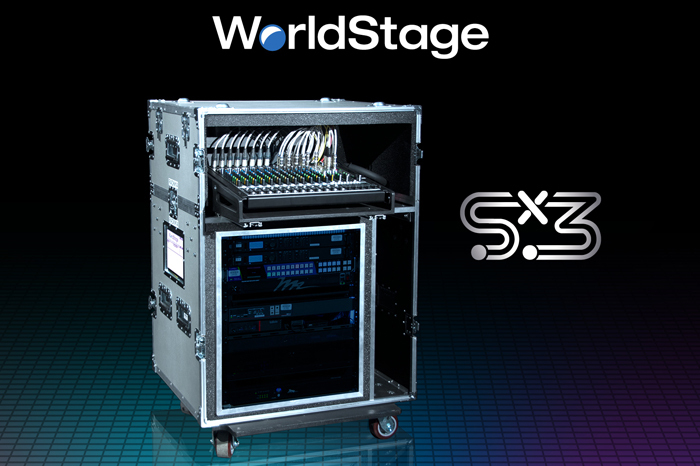 For more information on the Sx3, visit the WorldStage Sx3 website at https://www.worldstage.com/products/sx3-self-contained-show-system/. To view other news from WorldStage, visit our news section at https://www.worldstage.com/latest-news/.